The 2018 Volkswagen Jetta isn't like most compact sedans. It's bigger, it's affordable, offers a sporty drive and comes in 6 trims ranging from the $18,645 base model S to the $29,545 stylish and performance-based GLI. 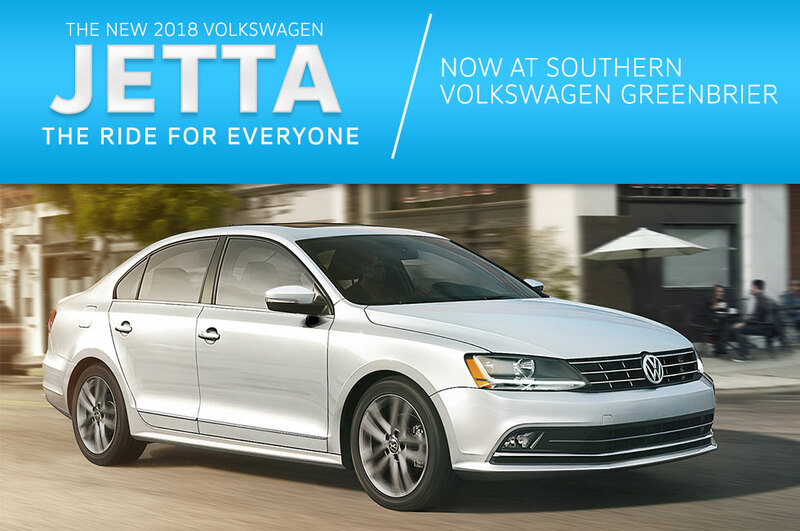 As one of the most affordable German sedans on the market, the new Jetta offers a little something for everyone - plenty of interior space, state-of-the-art technology, great fuel efficiency and a superior safety rating. The 2018 Volkswagen Jetta comes with a choice of 3 engines. The base engine found on the S, Wolfsburg Edition and SE is a 150 horsepower 1.4-liter turbo that gets an EPA-estimated 28/40 city/highway MPG. The SE Sport and SEL trims feature a 170 horsepower 1.8-liter turbo engine that gets an EPA-estimated 24/33 city/highway MPG. For the most power, drivers may want to steer their attention to the GLI trim. Its 2.0-liter turbocharged engine delivers 210 horsepower and gets an EPA-estimated 24/33 city/highway MPG. Unlike most compact sedan, the Jetta isn't short on space. With 16 cubic feet of cargo space in the trunk, none of your golfing buddies will be looking for another ride to the links because that's more than enough room to stow 4 sets of golf clubs. Take your favorite apps for a ride in the new 2018 Volkswagen Jetta. Its App-Connect allows drivers in Virginia Beach and Norfolk to plug in their compatible smartphone and access music, navigation and more. Other standard and available features include a 400 watt, 9-speaker Fender® Premium Audio System, SiriusXM® satellite radio, Apple CarPlay™ and Android Auto™, a cooled glove box, and a premium color Multifunction Display that makes it easy to track your trips. The 2018 Volkswagen Jetta earned a 5-star safety rating from the NHTSA and was also named a Top Safety Pick by the IIHS. Standard and available safety features include a rearview camera, blind spot monitor, park pilot, forward collision warning and rear traffic alert. The 2018 Volkswagen Jetta is affordable, spacious, technologically advanced, safe and now offers a 6-year, 72,000-mile limited warranty - longer than most of its competing brands. Click the button and fill out the form to schedule your appointment now!